I'm having a bit of a run of finished projects at the moment. Novel, but exciting! I finished this one last night. All I need to do now is find something more appropriate than a crochet hook to use as a fastener. It's lovely and cozy, and I can't wait to try it out properly. It should see me well through this winter as the bump (aka peanut) expands, and should transfer nicely to normal wear ready for next winter. Warm and snuggly and perfect for the cold snap. Even better that it goes from maternity and back to normal again! It looks gorgeous Anna. So perfect for your growing tummy. I made one at market today for Indi, they are a bit adictive. I might just need one in that gorgeous colour too. So just a quick question...have you blocked it and if so how? Mine has been worn non stop for a few weeks now and is nowhere near as neat looking as yours. 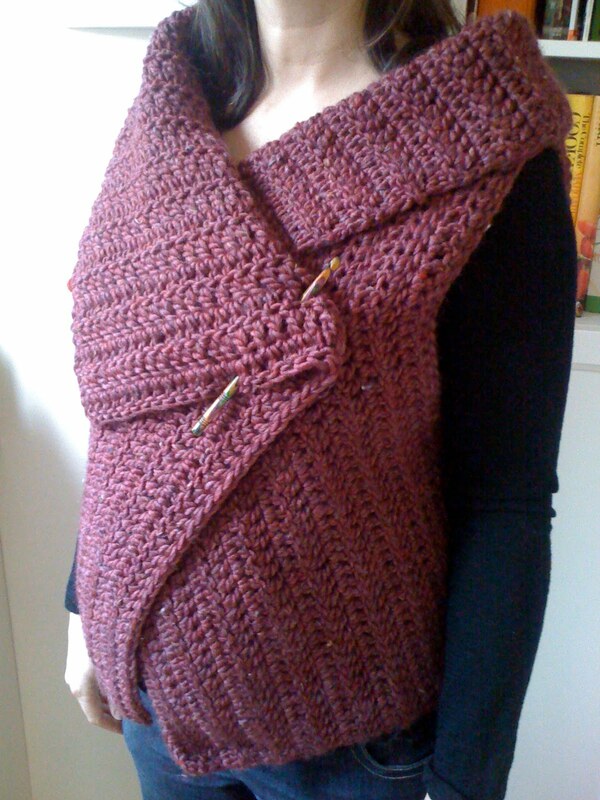 Hooray for a finished item that takes into account an expanding belly! Well planned Anna. Gorgeous colour too. Oh my! Been out of the blogging loop for waaaaay too long. I'm so glad I didn't miss out on this! It's wonderful! How great does it look? Will need to plan my own one now!! Your wrap looks so cute and will surely keep you and the peanut lovely and cozy through this very cold winter! Personally I love the crochet hook! This just looks amazingly stylish & snug. I must have missed the bit about peanut, congratulations! P.S. I did eventually put together a tutorial of sorts (very rough) about flipping the collar on men's shirts. ohh, that looks fantastic..especially with cute little bump! Oh my goodness this is so lovely and so is your beautiful tummy! I wish I had something like that for my big belly! xo m.
Peanut is looking mighty comfy in there. You do great wrap vest, you do. Ahhhh.... Perfection!! Really lovely and a great shot of your belly too. I'm with Angie on the crochet hook... Or a knitting needle would look awesome too. This is gorgeous! Love the shade and texture in it!